This super-tall lace-up has an extra-heavy-duty steel linesman shank to provide stability on narrow perches. A cushioning Poron® Permafresh® insole protects your foot against microbial and fungal development. Walk tall! 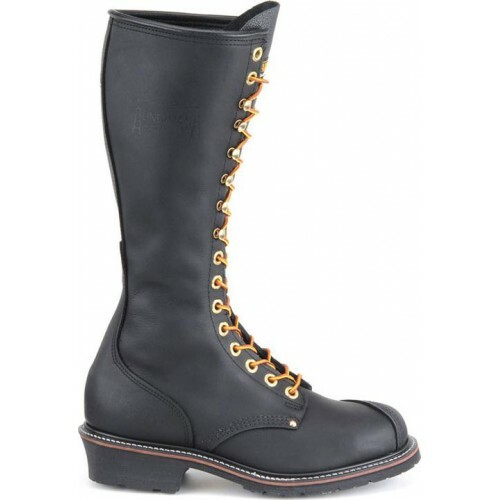 Also a substantial motorcycle boot as illustrated. Vibram®: The Vibram® brand is recognized for its high performance soling products used in rugged, outdoor and service footwear. VIBRAM® and the Yellow Octagonal Label are registered trademarks of Vibram®S.p.A. of Italy. Quabaug Corporation, North Brookfield, MA, is the North American manufacturer of Vibram® soling products under exclusive license. Safety Rated Electrical Hazard: Footwear tested by an independent lab that can withstand applications of 14,000 volts at 60hz for one minute without leakage.